Revised kinematics, not just dropped knuckle. – Nissan 370Z is a well designed car for enthusiast driver. The car performs well on streets and can be taken to a race track. If the focus is more towards performance, then the car can act even better with lowered ride height, but then the factory designed kinematics wouldn’t work as it supposed to. 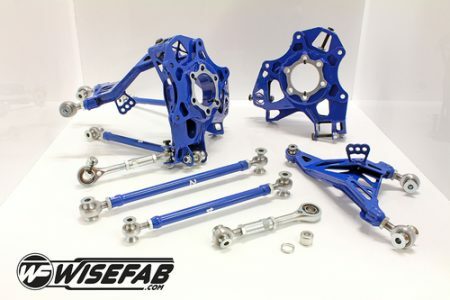 The Wisefab kit would give a good kinematics with lowered car – higher roll center, antisquat, revised cambergain and bumpsteer for maximum grip. About the same weight as original aluminium suspension – All the metal components on Wisefab 350Z rear suspension are from high strenght steel, including sheetmetal components, tubes, tube ends and rod end housings. Also for weight reduction and stiffness purposes all the suspension links are designed straight and tubular. Top arm is sheetmetal boxed type. CrMo 3 piece design rod ends and spherical bearings used, no rubber bushings. Easy camber adjustment – Special teethed washer is used for adjustment. Possibility to use either original 370Z , 350Z or S-Chassis hub with bigger CV joint.